The PowerScore LSAT Logic Games Setups Encyclopedia, Volume 2 provides extensive discussions of each and every game from LSAT PrepTests 21 through 40, including complete game setups and detailed analyses of the rules and inferences for each game. ● Every single question is clearly explained by David M. Killoran, the author of the renowned PowerScore LSAT Logic Games Bible, using PowerScore’s patented techniques, strategies, and overall approach to the Logic Games section. ● With extensive discussions of 20 full game sections, and 80 logic games, the 388-page Setups Encyclopedia, Volume 2 provides the most complete and effective solutions available. ● Setups Encyclopedia students will also have access to a unique website that provides additional materials to complement the book, answers to frequently asked student questions, and a cross-reference listing the source location of each game in the book. 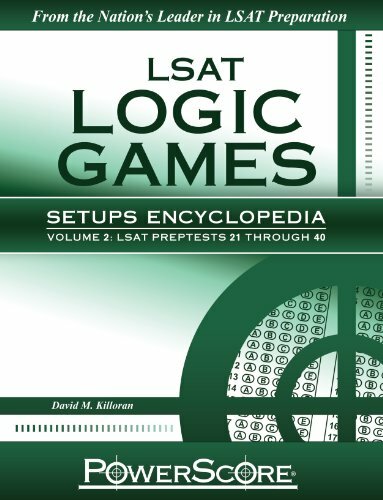 Note: The text of each LSAT logic game is NOT included in the LSAT Logic Games Setups Encyclopedia, Volume 2 and must be purchased separately. We recommend purchasing PowerScore LSAT Game Type Training Volume 2, which contains the original text for every game discussed in the The Setups Encyclopedia Volume 2. If you already have many of the games and are just looking for a few select tests, those can often be purchased directly from PowerScore or Law Services. In addition, the book uses the diagramming methodology, approaches, and terminology from the PowerScore LSAT Logic Games Bible, and a working knowledge of those techniques will increase the value you derive from the Setups Encyclopedia. PowerScore offers comprehensive LSAT, GMAT, GRE, SAT, and ACT live and online preparation classes. For more information about PowerScore’s publications or services, please visit PowerScore.com. Dave Killoran, a graduate of Duke University, is an expert in test preparation with over 20 years of teaching experience and a 99th percentile score on a Law Services-administered LSAT. In addition to having written PowerScore's legendary LSAT Bible Series, and many other popular publications, Dave has overseen the preparation of thousands of students and founded two national LSAT preparation companies.